It’s rare to have a knife that’s simultaneously confusing yet absolutely hypnotic. But that’s what you get with the latest Badass Knife of the Week. The Cold Steel Ti-Lite marries the look of the traditional Italian stiletto with the modern materials and conveniences of the present day. Coming in various sizes, the version we’re highlighting is the largest and boasts a lengthy 6-inch blade. This large Ti-Lite features Japanese AUS 8A stainless steel, an alloy that’s easy to sharpen and resists rust well. The blade on this thin folder has a lot going for it. You can deploy the blade using the thumb stud or pull it out against your pocket for a Wave-like opening in one swift motion. The Wave-like protrusion also acts as a guard to keep your hand from slipping onto the blade. Cold Steel uses 43 percent glass-filled Zy-Ex for the handle scales. Zy-Ex is a synthetic material that’s durable and lightweight. Cutouts in the scales shave some grams off the overall weight and give the grip even more texture when wielding the large folder. For coming in at an overall length of 13 inches when fully engaged with the liner lock, the knife comes in at only 7.5 ounces. Thanks to its reach and quick deployment mechanism, this knife makes a great self-defense tool. 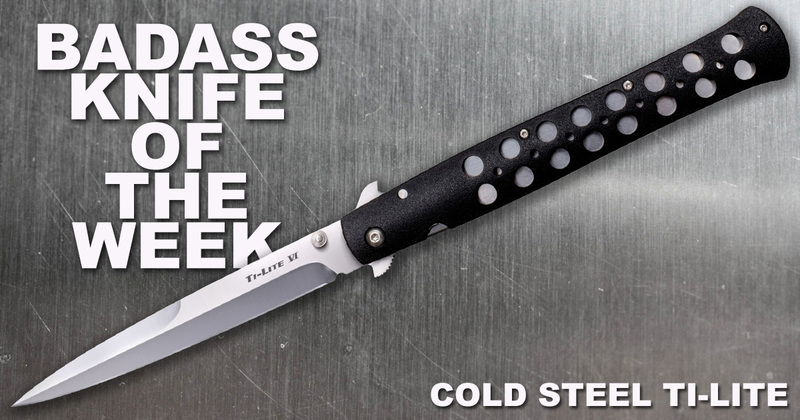 For more info on this Badass Knife of the Week, see the product page for the Cold Steel Ti-Lite.